In out culture, age is not always as respected as it should be. Age is defined by the years we’ve lived, but in so many ways we can change the way the years affect our bodies and our minds. By taking an active role in our own health we can help to determine our own age. By eating right and working out regularly we can keep our bodies alive and feeling young! Elle “The Body” McPhearson is gracing the cover of Fitness Magazine this month. McPhearson is nearly 50 years old and still rockin’ her bod in a hot gold swimsuit on the cover, but more importantly she treats her fitness as part of her life, not just to look hot, but to FEEL hot. 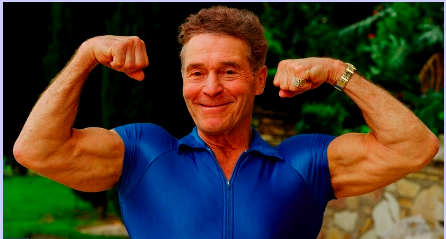 The modern day founder of the fitness industry, Jack LeLanne, lived to age 96. He truly was living up until the day he died working out and eating a mainly vegetarian diet. To the right is a picture of the namesake of the Jumping Jack at age 71! These photos speak for themselves. Treat everything you put into your body as a gift. It’s true, we are what we eat, so respect yourself with your food. Take time each day to move your body. Check out Jack’s TV show. It’s simple, times haven’t changed very much. Yes, there are new technologies, but really all you need to do is move. Stick with the motto, “If you don’t use it you lose it.” So keep at it, my FIERCE Friends! I wanna see pictures of you at age 50 in your gold suits and at 70 flexing away! This entry was posted in FIERCE HEALTH, FIERCE SOUL, FIERCE WORKOUTS, FIERCE- ISH and tagged balance, body, diet, fitness, health, mental health, metabolism, mindful eating, motivation, self improvement, strength, weight-loss, wellness, workout by GETFIERCE TRAINING. Bookmark the permalink.